The Sony HT-S700RF is not your typical home cinema system. It consists of a soundbar instead of front speakers, with two tallboy-style rear speakers plus a subwoofer. Sony claims that this system, which has a hefty power output of 1000W RMS, has been designed specifically for the Indian market. It has both auxiliary and digital inputs, supports HMDI-ARC, and even has Bluetooth and a USB port for you to play your media through. The system is priced at Rs. 39,990 but can be found for less than Rs. 38,000 online. Does Sony’s new soundbar home cinema system deserve a place in your home? We find out. The entire system consists of a sleek but really long soundbar with three individual drivers, two tallboy-style rear speakers, and a modest-sized 20cm subwoofer. The design is not ostentatious in any way, and the system does not scream for attention. The soundbar has a diamond-cut metal grille at the front with a rhombus pattern that looks sleek and classy. The tallboy speakers and subwoofer are finished in matte black, and look simple and elegant. The quality of materials used is top-notch, and the entire setup feels premium. The soundbar itself is devoid of any buttons, and all controls are found on the top of the subwoofer unit. There are five buttons in total: one for power, one to change the source, two to control the volume, and one for Bluetooth pairing. There’s a USB port at the front of the subwoofer, through which you can play music and videos from a USB storage device. Files can be navigated via the Sony Music Centre app. 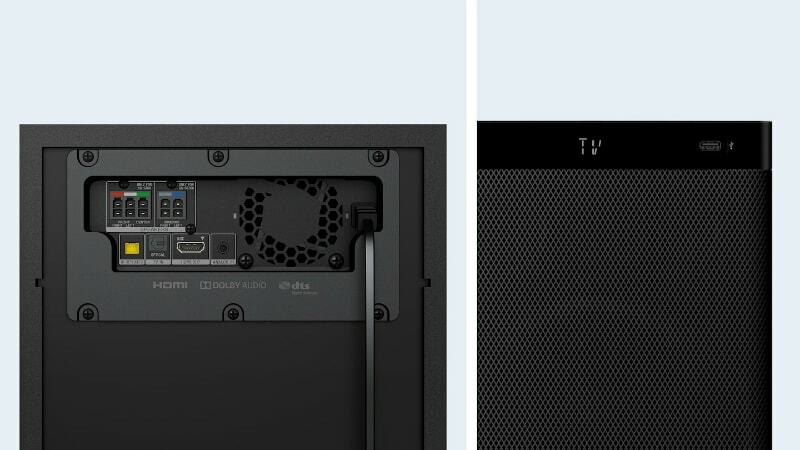 The subwoofer’s power supply is built in but you do have to deal with a pesky power brick for the soundbar itself. There is a dedicated Bluetooth button on the remote in addition to the one on the subwoofer. When either button is pressed, the system automatically tries to connect to previously paired devices, and then goes into pairing mode if none are available. The soundbar and the rear speakers are connected to the subwoofer using wires. We would have preferred a wireless setup at this price point. The subwoofer also has all the inputs, and the selection is a bit sparse. There is one HDMI port with support for ARC (Audio Return Channel), which means you can send your TV’s audio to the system through the same HDMI cable that feeds it. There’s also a 3.5mm auxiliary jack, an optical S/PDIF input, and the aforementioned USB port. At least one additional HDMI port and optical input would have been appreciated. The remote is chunky and well-built, and its buttons, which are made of rubber, are not mushy. Along with the usual power, Bluetooth, input selection and volume buttons, there is a menu button, enter button, playback controls, and buttons to control the intensity of the subwoofer. There are five audio modes on offer, all of which have individual buttons on the remote: Voice, Night, Music, Cinema, and Standard. While Bluetooth 4.2 will be a popular feature, the system does not support the LDAC, aptX, or aptX HD high-quality audio streaming codecs, which is a shame. AAC is supported, but that is a small consolation. NFC is also conspicuous by its absence; a feature commonly found in this price range. The three front speakers and the two rear speakers deliver 152 Watts of power each, and the subwoofer is rated at 240 Watts. Headphones and speakers from Sony’s stable often have a very bass-focused sound signature, but we were pleasantly surprised with the clarity of sound delivered by the HT-S700RF. No frequency range dominates the others, and the bass is crisp and pronounced and without hijacking the sound mix. The soundstage is excellent, and the two rear speakers do a great job of distributing sound across a room. Clear and expressive mids are one of the highlights of this soundbar. Dialogue is full-bodied, and even in action sequences, isn’t not lost within the usual sea of explosions and background music. If you have trouble hearing dialogue in movies or TV shows, the HT-S700RF might be a good choice. While watching Harry Potter and the Half Blood Prince, the dialogue was crisp and clear, and the speaker system did absolute justice to Nicolas Hooper’s scintillating soundtrack. Playing Forza Horizon 3 on our Xbox One S was also a terrific experience, with the rumble of engines pulsating through the rear speakers, and the subwoofer adding just the required amount of oomph needed for the EDM-heavy soundtrack. The HT-S700RF did a commendable job with music, although the lack of high-resolution audio codec support did stifle the Bluetooth experience a bit, in our opinion as audiophiles. The sound signature is quite balanced, and as a result the soundbar handled almost all music genres with aplomb. The crisp treble lends itself well to rock and metal tracks, and the expressive mids make listening to Blues a pleasure. Those who prefer room-shaking bass might be better served by other options such as the JBL Cinema SB450, but the low-end on offer is punchy enough to drive EDM tracks and explosive cinematic moments. The HT-S700RF 5.1 Home Cinema Soundbar System is a very well-rounded home theatre system that is built well, looks classy, and offers crisp and balanced sound. It reproduces music as well as movies very well, and the bundled remote is solid and easy to use. We could have done with more inputs, and a home cinema system at this price point should ideally not require wires. However, these drawbacks are not enough to take away from the HT-S700RF’s appeal. If you can live with the wires, this home cinema system from Sony should definitely be on your shopping list.